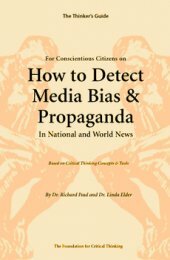 Designed to help readers come to recognize bias in their nation’s news, to detect ideology, slant, and spin at work, and to recognize propaganda when exposed to it, so that they can reasonably determine what media messages need to be supplemented, counterbalanced, or thrown out entirely. It focuses on the internal logic of the news as well as societal influences on the media. The logic behind bias and propaganda in the news media is simple and it is the same the world over. Each society and culture have a unique world view. This colors what they see and how they see it. News media in the cultures of the world reflect the world view of the culture for which they write. But the truth of what is happening in the world is much more complicated than what appears to be true in any culture. To be a critical reader of the news media in any society, one must come to terms with this truth and read accordingly. Critical thinking is a complex set of skills that reverses what is natural and instinctive in human thought. Our goal in this publication is to help our readers lay a foundation for transforming the influence of the media on their lives. It is in all of our interests to critically assess, rather than mindlessly accept, news media pronouncements. Our hope is that we can aid readers to become more independent, insightful, and critical in responding to the content of news media messages and stories. There are (typically) multiple points of view from which any set of events can be viewed and interpreted. Openness to a range of insights from multiple points of view and a willingness to question one’s own point of view is crucial to “objectivity.” Objectivity is achieved to the extent that one has studied a wide range of perspectives relevant to an issue, obtained insights from all of them, seen weaknesses and partiality in each, and integrated what one has learned into a more comprehensive, many-sided whole. Learning to detect media bias and propaganda in the national and world news is an art that takes an extended time to develop. Yet it is also an art essential to intellectual responsibility, integrity, and freedom. This mini-guide presents a starting place for the development of intellectual analysis and assessment applied to news stories. As one develops in this art, one experiences a progressive shedding of layers of social indoctrination and ethnocentricity. Is it Possible for the News Media to Reform? Is the Emergence of a “Critical Society” Possible?